Takkyu Ishino is known mainly for being a member of electropop band Denki Groove, but in recent years he has moved into a second career as an in demand techno DJ and remixer, becoming well-known in Europe. Take a listen to Denki Groove’s 1993 album Vitamin, and then compare it to Ishino’s 1993 remix of Pizzicato Five’s “Twiggy Twiggy,” which reduces the song down to the chanted title words and a pulsing, evolving techno track. Ishino’s techno expertise gives Vitamin its punch, but not its pop; on “Twiggy Twiggy” it’s all him, making no concessions to the mainstream. In 1990, Ishino teamed up with high school friend Pierre Taki and formed the short-lived band Zinsei, which soon became Denki Groove with the addition of a few members. The band broke through in 1993 with Vitamin and 1994 with Dragon, and in 1995 they took a hiatus to focus on solo projects. It was here that Ishino first unleashed his sound in Dove Loves Dub, which mixed techno with ambient and breakbeats. But it was his DJ mix CD, Mix Up, Vol. 1 that got real attention, letting the European techno scene that Japan could produce serious techno that could advance the form, not just copy it. This led, several years later, to DJing Berlin’s Love Parade, one of the first Japanese to do so. 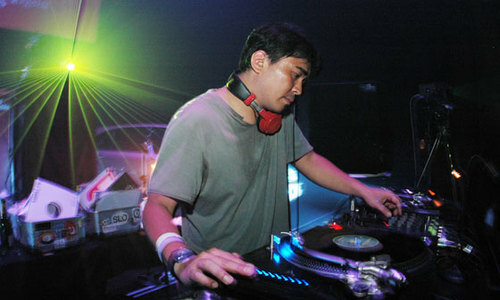 In 1998, Ishino began the Loopa label, releasing his own material as well as others. Karaoke Jack was released in 2001.